Yesterday, I got to have some more adventures in charging my Electric Vehicle. I was working in Milwaukee, Wisconsin, at a location about 37 miles from my house. The car I’m driving is a Mitsubishi iMiEV – the least expensive, most efficient*, smallest battery pack electric car in the United States. It also has an official range per charge of 62 miles. Since I drove 37 miles to work, yes, I would have to drive those same 37 miles back, for a total of 74 miles, or about 12 more miles than the car was ever designed for. Normally, I could have simply taken the other car, but the weather was nice, and I knew I’d finish the job fairly early, so I’d have some time to go find a charger when I was done with the job. Also, I was feeling adventurous. We worked straight through lunch and finished at about 2PM. My friend and co-worker, Rich, asked about what I was planning to do. After mentioning that a CHAdeMO charge takes about half an hour, he suggested that we go plug my car in and the grab lunch together. I already knew of two Level 3 CHAdeMO Quick Chargers in Milwaukee, which I hadn’t been to before, on the University of Wisconsin Milwaukee campus. I used the PlugShare app on my phone to locate the charger, and headed that way. Rich followed me in his truck, and then before I pulled into the UW-Milwaukee parking garage, he rolled down his window and hollered that he was going to get gas. 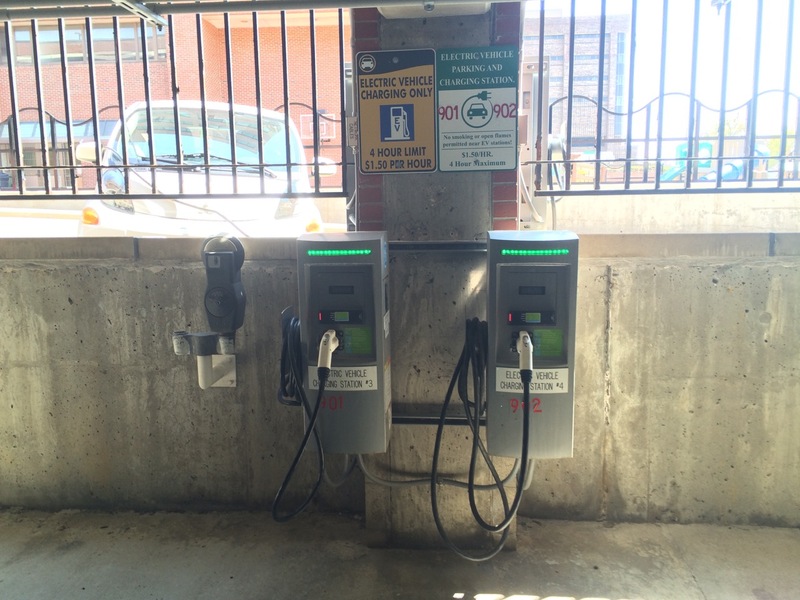 Inside the garage, the CHAdeMO was on one side of the entrance, and a pair of Level 2 chargers was on the other. I pulled up to the CHAdeMO and parked. Looking at the charger, there was a note: “OUT OF ORDER”. Oh well, I could at least use one of the Level 2 chargers. Nope! Both of those were in use! Oh well, I guess that’s a good problem to have – at least people see that EV-ers actually DO use the chargers! I used PlugShare to look up the other CHAdeMO on campus. THIS TIME, I scrolled through all the user comments left, and found a few saying “Offline”, “Not Working”, and “I don’t think they’re ever going to fix this….” My charging options were starting to sound not-so-good. Rather than even bother trying to get to the other high-speed charger, I headed off to my last option. There was a listing for a Level 2 charging station on the outside of a different parking structure. It was only a few blocks away, but one road didn’t go through the way I expected. I did eventually find it. 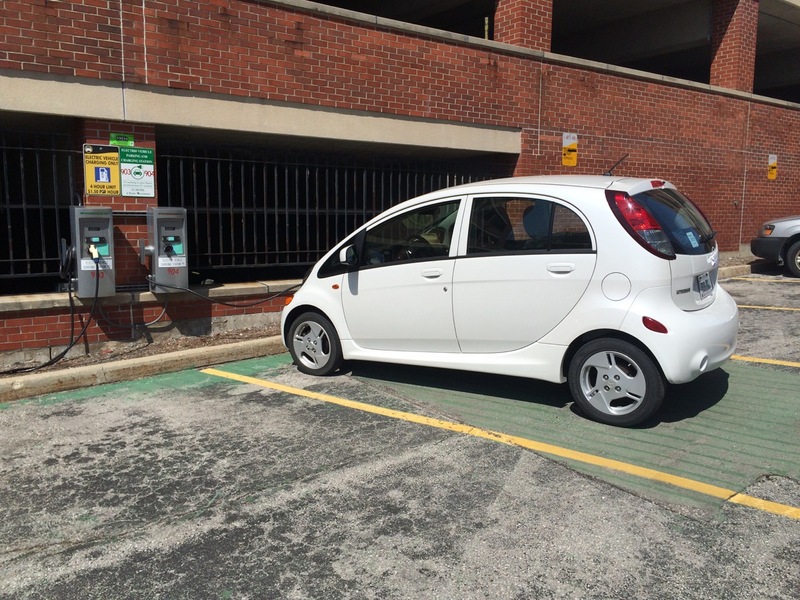 At THAT station, there were two empty parking spaces and two unoccupied chargers! Perfect! I pulled up, parked, and approached the charger. On the charger, there were directions listed. 1) Swipe Card, 2) Plug In, 3) Charge. Um. What card? There was clearly an RFID reader. There was no 800 number or web site listed to get a card. I did have my ChargePoint card on me. Would it work? I pulled out my card and held it up to the reader. I swiped it past the reader. I shook it angrily at the reader. NOTHING! So now. I had two broken high speed chargers, two occupied level 2 chargers, and a charger that I couldn’t turn on! What else could I do? Hmmmm. I decided to just plug in the cord. When I did, the charging station sprang to life! Finally, the small display illuminated and I could hear the sweet “ka-lunk” on the internal contactor snapping shut, and my car began to charge! Relieved that my car was FINALLY charging, I headed back out on foot, several long blocks down Oakland Avenue, towards the Gyro shop for lunch. Ironically, it took that entire time for Rich to find gas, fill up his truck, and head back. We leisurely enjoyed Gyro and Chicken Kabobs while chatting about what we’ve been up to lately. When done, we said our goodbyes, and I strolled back up towards the car. I noted that the car had four more “ticks” on the battery meter than when I started. Each mark represents about 1 kilowatt-hour of energy, and the car can go about 4 miles per kilowatt-hour. I had added about 12-16 miles of range to the car. I headed inside the store and ended up speaking with the Assistant Manager. Unfortunately, she wasn’t able to give me an exact date as to when the charger would be up and running. I left her my card and asked if she would kindly contact me when it was. 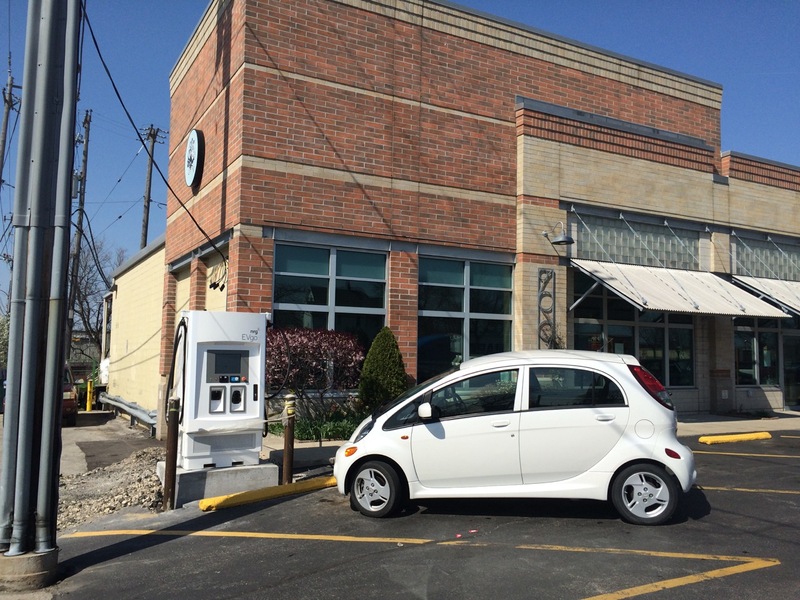 The Outpost is a great location for a Quick Charger. Besides being a very nice grocery store, there’s a cafe inside with a hot food bar, deli sandwiches, coffee, and restrooms. It’s perfect for a person to grab a bite to eat while charging! This location wasn’t on PlugShare yet, so I added it, with a “Coming Soon!” comment. After that, it was the ride back home. While the weather was beautiful, the traffic was TERRIBLE! Fortunately, an electric car is PERFECT for traffic jams! It just sits there, instead of wasting gas idling and creating lots of heat and noise. It was in the mid 80’s and very sunny. I could feel my left arm getting sun-burned in the direct daylight. I might want to invest in getting some window tinting for my little electric economy car. Not only would it look nice, but it would keep the car cooler in the summer! When I finally got home, I had two ticks left on the battery meter. Since I charged up four of them, I can reasonably assume that I would NOT have made it home without at least a little charging! Total trip was 74 miles. Could I have done that same trip in a gas car with no worries about range? Well, yes, I could have, but then I would have been using gas! In fact, pretty much ANY other car would have gotten me around all day without needing a charge! A Nissan Leaf or BMW i3 could have gotten me there and back with 10 miles to spare! It’s unfortunate that EV Charging Stations are not yet standardized. At gas stations, although there are different brands, the user experience is almost identical at every location – pull up, put in credit card, put hose in car, get gas, drive away. Price of gasoline from one station to another is nearly identical, and there are gas stations everywhere. 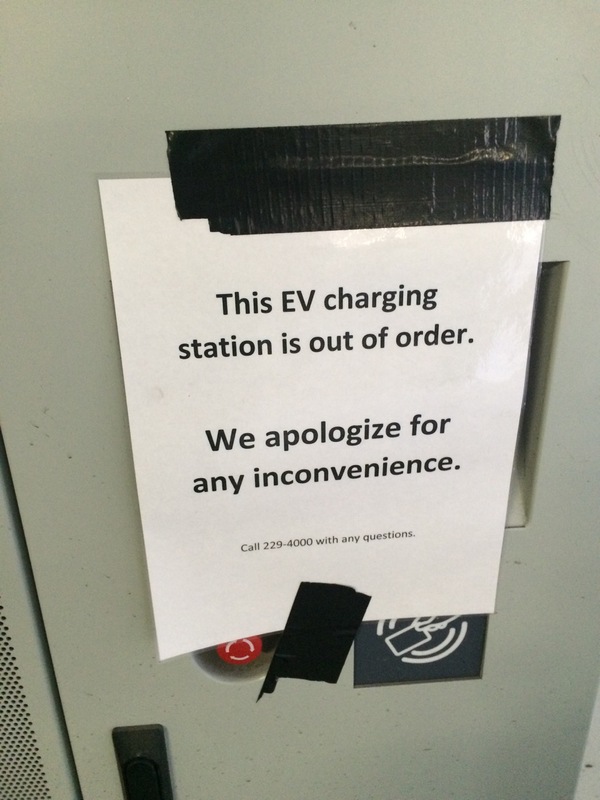 EV Charging Stations aren’t quite there yet. Prices range from irrationally high “Convenience Fees” to FREE! As of yet, I haven’t seen Free Gas at the gas stations! Using the PlugShare app, and following user-generated content sure helps with finding stations. I’m glad to see new stations popping up at locations like the Outpost. Those ones are even dual CHAdeMO and CCS, to avoid format wars and create a bit of future-proofing. As it is right now, 89% of all American commutes are 30 miles or less. Most EV drivers just charge up at home. It’s far cheaper and more convenient than going to a gas station. 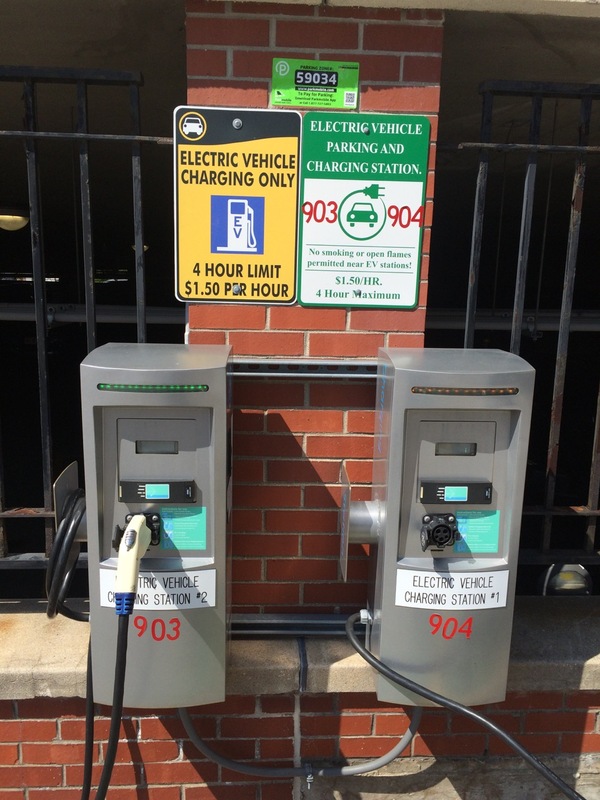 So, public EV charging is really about longer trips and special travel arrangements. And, with the coming wave of 200-mile-plus range cars, we’ll only really be talking about public charging for long-distance, cross-country trips! Once again, here I am in the “Worst Case Scenario”. But then, even driving farther than my car is designed for, even with multiple chargers not working, it all still works out just fine. *My car is a 2012 model year. It was the most efficient car that year. Now, the BMW i3 takes that honor with a few more MPGe than the iMiEV. In terms on battery pack size, the iMiEV has the smallest battery pack OTHER than plug-in hybrids, which use a gasoline engine as well. Hi Ben, a little unlucky with the chargers again. In our UK imiev clone we have taken to charging on the outward leg of a trip on journeys just beyond range as yours was. Saves a bit of angst and more choices as well. Keep the blogs coming always enjoyable.